James Cameron has told TechRadar that he is finding the process of converting Titanic into 3D "mind numbing" and has revealed the intricate detail that goes into retro-fitting a live action movie with 3D. 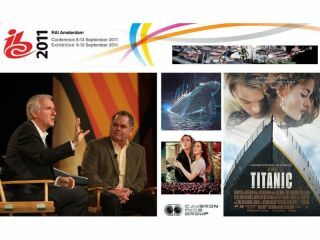 Titanic 3D is to set sail 6 April 2012 to coincide with the 100 year anniversary of the infamous ship sinking. Cameron is doing one of the most extensive 2D to 3D conversions ever on the movie, spending a year finessing the footage at a cost of $18 million. Speaking to TechRadar he revealed that the process, of which he is nearly halfway through, has been nothing short of exhaustive. "I really don't enjoy the process," Cameron explained. "While Vince [Pace, cinematographer] and I sit gleefully watching 3D images being shot, a conversion is the exact opposite. "It is a mind numbing process of creating depth subjectively. It is as simple as 'this person is bigger than that person, they therefore must be closer put them here'. It is an endless discussion with the artists." To make sure the film looks just right in 3D, Cameron is going through not just every scene, but every shot of the movie bit by bit. "I am five months into this process so the artists are becoming good and starting to read my mind a little, so it has become easier, but I still sit there with the jog wheel and look through the movie frame by frame and make notes on depth. "'That should be closer, that should be further back, there's not enough full depth here, there is not enough volume on that shoulder, a little more volume on that urn in the background, see that chair in the background on the left, no the other one on the left, that one needs to come forward another six inches… when the captain stands up we have to do an interlocular dynamic, da da, da da, da da… it's fricking endless! "It's a mind-numbing process; it's like mowing the lawn with a toenail clipper." Cameron explained to TechRadar that the process of filming 3D is a much more pleasurable experience. "The organic process of shooting 3D, native 3D, is that you walk over to the monitor and you see it in 3D, you play it back and it is in 3D. "The actual process is great; you are having fun, as you have integrated it into your workflow." Read more about James Cameron's thoughts on 3D in TechRadar's in-depth interview.